With two backpacks on my back I left towards the start of the San Francisco Randonnuers 2013 Fort Bragg 600k. I have done this event a few times before with mixed results but alway had a good time overall. This time I was using the Magnic Lights I had just received and tested earlier on the week. Two front lights and two rear lights that, unlike dynohubs, don't create any drag and unlike battery operated lights, don't require an external power source. Took a few photos of riders listening to last minute instructions and we were on our way. I would be riding at an easy pace and trying to make short stops. It has been two years since I have not been able to ride brevets where I feel well all the time. It is getting better but I still don't feel I am at my "normal". Just a few miles from the start, when it was time for another photo my camera decided it was time to stop working. The retractable lens got stuck on the middle position and that was the end of it. No more photos, at least not with that camera. Phone photos would have to do. 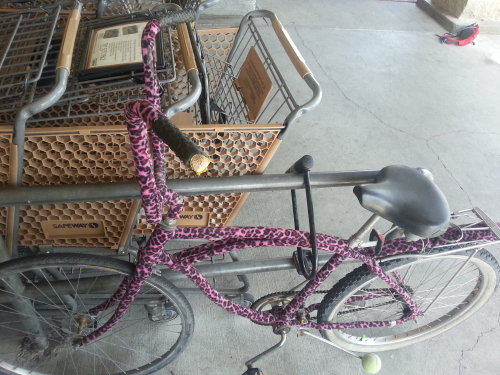 While ridding through Southern Marin, Rob H asked me what was my plan for the ride. I usually don't have one but this time I had used the calculator I did for the SFR website to print a guide of where I should be and when I should be drinking my plastic calories aka Ensure. I printed two versions one very optimistic finishing on 30 hours and another more realistic, finishing in 33 hours, considering how I have been feeling lately. Rode with Rob to the bottom of the Olema hill where he climbed with the rest of the group, I keep my steady slower pace. When I got to Point Reyes Station plenty of riders were waiting on line at the supermarket to purchase food and get a receipt. I opted to get money from the ATM machine and one of the Ensures I had in my bag. All fine and I was out of there before all riders I had seen; only problem was I had forgotten to get a printed receipt. The habit of always requesting electronic receipts sent to my email. Oh well I'll talk to Rob and explain my mistake. I rode very relaxed to Petaluma, no a single rider passed me, that was weird. Once in the Safeway got my receipt and was ready to leave but decided to wait a little for other riders to get ready so we could ride together the next segment together. Now Bryan C, Gabe E, Rob H, Mike B where ready to roll. At the first light we had a few more riders in our group Eric L, Tom V and a rider who I have seen before but never learned her name Kaley M.
Except the two flats we had, one Rob's and one mine, It was an easy flat ride to the next control in Headlsburg. It was hot now probably in the high 80's. 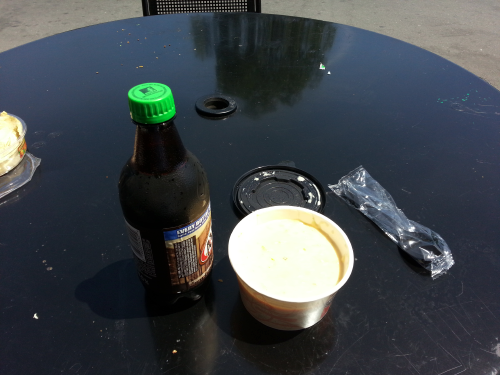 Soup, and a root beer soda. Freaking hot, I was glad I had chosen a synthetic jersey over a wool one. Bryan, Gabe, Rob and I left together and rode more relatively easy miles to Cloverdale, however temperature was still climbing and I was feeling it, it was now 95° F. I started getting cramps, that was not a good sign with just 100 miles under our wheels and ~270 more miles and most of the climbing ahead. It was going to be a long ride for me. 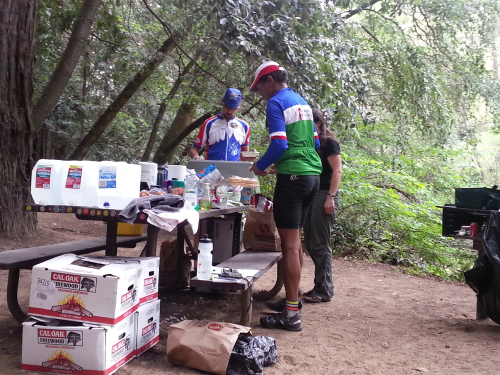 At Cloverdale we stopped for a last chance of water and food before the hwy 128 climb. Leaving the gas station's 7Eleven I felt tired and told Rob not to wait for me on the climb. Apparently Gabe also said something similar. They went ahead but soon I saw Gabe on the side of the road, he was ok just taking a break, when I was catching up he started riding again. This repeated a few times. The heat was affecting not just me. Got t the top of hwy 128 together but on the descend and miles after that Gabe was riding ahead. This section of 128 traverses lovely Anderson Valley, the views and new pavement made for a nice riding. Cramps were with me all this way. At Yorkville I saw Bryan and Rob outside the store, I did not need water or rest so kept going. Can't remember where they passed me but by the time I got to Boonvile, just ~5 miles from the Indian Creek campground, they were at a store getting more food and water. I kept going again. 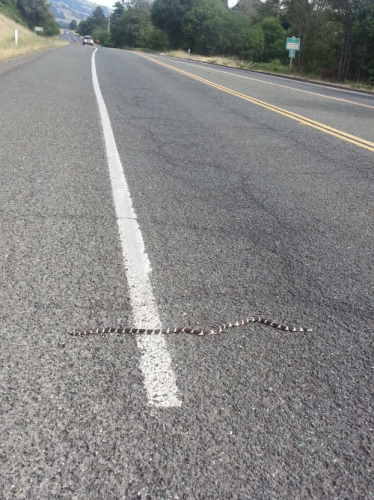 A mile or two after town I saw a 3-4 feet long snake basking on the sun. Got to take a photo of that! Phone when out and shot the photo, a truck was approaching on the distance and I told the snake not to cross but she did not want to listen and went towards the road. The tire of the truck missed her by a few inches, she coiled up and after a few seconds decided I was right and moved back to where she came from. While watching this I remembered I had a roll of Tums that I keep in my bag more for helping me with cramps than stomach issues, chew a couple of those tablets. Just ahead another even larger snake also on the road shoulder but this one was happy to stay still. The cramps where now at bay thanks to the Tumbs. I stopped at the campground and was welcomed with offers of soup and a ton of different drinks. Used the luxury, big and clean restroom and went on my way. Bryan, Rob and Gabe had not stopped at the campground. While riding under the canopy of trees, near the coast, Tom V, Eric L, Kaley M and Tim M passed me. Just a few miles ahead they were on the side of the road changing into night riding clothes, I joined them and changed into warmer clothes and started riding a little before them; close to Fort Bragg Tom and then Tim pased me. The segment to Fort Bragg went surprisingly well for me. My new front and rear lights had been working since I left home, they don't have off switch. Now that it was getting darker I could see them at work a little better. Got to Fort Bragg's Safeway, the next control near 8:30, Bryan and Gabe where leaving and said they were headed for McDonalds. Inside the store I found the Tim W and Roland B distinct recumbents, other riders where there. I went to get soup. Oh crap, they had already pull it off the soup island. Asked the deli attendant and he showed me some other stuff they had that was cheap. A bowl of macaroni and cheese and a bag of deep fried jalapeño cheese things, yeah greasy stuff! While eating my stuff John P come in. In the morning he had to go back home and switch bikes as his light malfunction before the start. Amazingly he had made up most of the lost time on that roundtrip and was now with us. Offered John leftover greasy stuff and started connecting the external battery to my GPS/bike computer. We left together Fort Bragg. Now it was dark and I could see my lights working next to John's. At slow speed his dynohub powered light seemed brighter but as soon as we got to cruising speed there was little difference, I was happy with my lights. 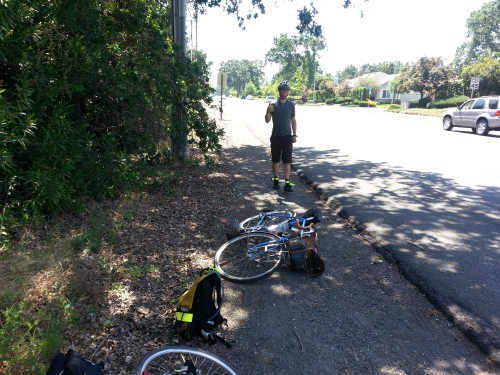 A little after Mendocino, we stopped for a break, as we were getting ready to move a group of headlights approached. It was Bryan, Gabe and Rob. We had just a few more miles on Hwy 1. Hwy 128 had no traffic and we could ride 2 or 3 abreast. We all have ridden many miles together in the past, the quiet road, clear night and mild temperatures made for a nice chat and ride. This was a great section of the ride. Got back into the Indian Creek campground where volunteers welcomed us with smiles, cheers and food. After changing into fresh clothes from my drop bag I had a bowl of soup. refiled my water and started getting anxious to move again. John had left while I was changing my clothes. Rob, Gabe and Bryan seemed very comfortable there but they all were climbing faster than me so I decided to start going and knew they would catch up with me on the hills ahead. I really enjoy the quiet ride with the clear sky and no traffic. Riding alone allowed me maintain a pace that let me rest while moving. There were some pockets of cold temperatures but for the most part the night was very mild, probably in the high 40°s F. I think Bryan and then Rob and Gabe catch up with me near Yorkville. I had to maintain my steady pace and saw their tailights disappear after a while. However Gabe was almost always on sight and he would stop here and there to rest. I stopped to do some clothes adjustments and to have another Tum tablet before the last 2 mile climb to the summit. Almost right at the top of the climb, another light came behind me, it was Tim M, very strong rider. We chat just a little and he moves on. Cloverdale was a few miles away. The weather on the other side of the hill was a little warmer. Entering Cloverdale I saw a couple of randonneurs leaving a motel, it was Jason P and Brian K who had taken a shower and slept a few hours. I went into a gas station mini mart where Gabe was resting. Rob and Bryan had left a few minutes before. After I had my coffee and ice cream Gabe and I left together. I think it was 5:30am. Gabe was riding a little slower, I maintained my pace and could see his light in the distance whenever I turned to look for him. Near Healdsburg I needed to use a bathroom I mean a had to use a bathroom so stopped at the Safeway to conduct business and then felt much better. The next control was just ahead and was an informational (info) control where we had to answer a question. When I got to the control Gabe was there. We answered the question and rode the rollers of Westtside Rd to hwy 116, it was very foggy. On hwy 116 there was not much wind and the flat miles went pretty fast. Guernville Info Control was inside the Safeway, I answered the question, bought some bread and jiuce and saw Gabe come in. After a while it was time to move on. Went looking for him but did not see him. Later that night I texted him to see how his ride went, it turned out he was seated on the Starbucks very close to where we parked our bikes but hidden from view from my position. I left and looked forward to Bohemian Hwy. This is a nice stretch of road. Traffic was almost non existent until I started approaching Freestone. I was, in my head, very close to the finish. At Valley Ford I tried the water spigot outside the fire station but the water that came out of it was very murky so I decided just to go across the street to the general store and get some. Weather was overcast and a little cool. That hill before Tomales was a crawl but on the other side what is is usually a bad flat section with very strong headwinds was not too bad. In Point Reyes Station I got a receipt from the ATM (made sure I got a printed one this time) got some water at the public restrooms had yet another Ensure and moved on, no need to spend time here. I just wanted to finish. Leaving Point Reyes Station was now hot and sunny and my toes hurt like hell when I started riding. I was still wearing double socks and toe covers and felt like my feet were on fire and my big toe nails were coming off, had to stop to fix that. After peeling layers and wearing just the thinner pair of socks things started to improve dramatically. I had not seen any other randonneur since Guernville that was odd as I thought I was not riding that fast.I rode into Faifax feeling ok but by the time I got to Larkskpur and the Camino Alto hill my energy level was as low as it would get during this ride. 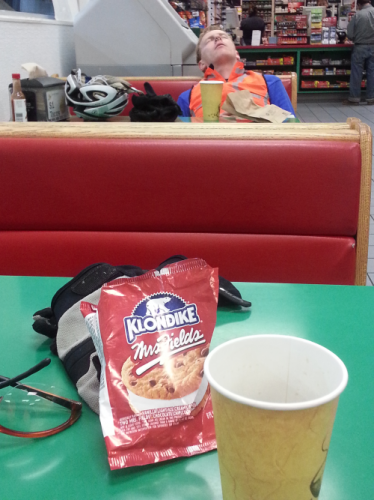 On the gas station at the bottom of camino Alto in Mill Valley I had to stop to get some kind of cold energy drink. What I had was a disgusting energy drink, can't remember the name, but it help me fight the heat and provided some energy. Sausalito and the hill to the Golden gate were not as painfull. Temperature on he Bridge was cool and nice and that help me push a faster pace. Got to the final control at 3:23pm, about 23 minutes over what I though it was realistic for me this time. Max P and "the Walkers" were volunteering.. Bryan, John and Jason where there too. After sorting all my receipts and completing my brevet card, Juliayn C who was serving as "Day of Event Contact" and offering her support to John, offered me a home made muffin/egg and a beer. Yeah! Thanks Juliayn! Jim G showed up when I was getting ready to go. He was returning from a mixed terrain ride. We chatted a little more with all riders and volunteers and rode home the last 5 miles. Did not feel sleepy at all until late that night.